Its NOT the Flower that we Like. Poinsettias are a wonderful worldwide holiday tradition. In fact, next to a Christmas tree, nothing else says Christmas quite like poinsettias. Displayed alone or in groups, they can add a festive splash of color to every dÃ©cor. From a centerpiece on a holiday table to a miniature plant decorating the corner of an office desk, to a colorful hanging basket that can brighten any room, the poinsettia is the perfect holiday gift. So how did poinsettias become so popular at Christmas–and where do they come from? According to Mexican legend, a poor Mexican girl named Pepita who could not afford a gift to offer to Christ on Christmas Eve picked some weeds from the side of a road. The child was told that a humble gift, even if given in love, would be acceptable in God’s eyes. When she brought the weeds into the church and laid them at the feet of the Christ child, they bloomed into red and green flowers, and the congregation felt they had witnessed a Christmas miracle. Poinsettias are native to the tropical forest at moderate elevations along the Pacific coast of Mexico and some parts of Guatemala. They are named after Joel Roberts Poinsett, the first United States Ambassador to Mexico, who introduced the plant in the U.S. in 1825. Poinsettias have come a long way from their humble beginnings. For years only variations of red flowers were propagated and grown. But now there are hundreds of color varieties available ranging from traditional shades of red, pink and white to burgundy, peach, striped, flecked and hand-dyed varieties. Poinsettias are fairly easy-going, and with proper care can last long past the holiday season. Just click on the link below for a complete care guide including tips for re-blooming the following season. 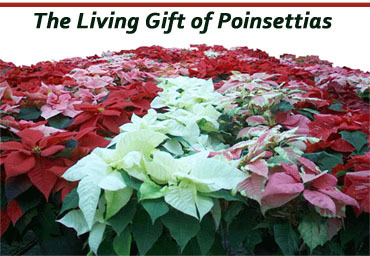 The length of time your poinsettias will give you pleasure in your home is dependent on how you treat your plants. With care, poinsettias should retain their beauty for many weeks, and some varieties will stay attractive for months. â€¢ Keep plants away from warm or cold drafts from radiant heaters, air registers or open doors and windows. Temperatures of 60 to 70 degrees are ideal. â€¢ Check the soil daily. If you choose to keep the foil wrapping around the pot, be sure to punch holes in it so water can drain into a saucer. Allow water to drain into the saucer and discard excess water. Water when the soil is dry beneath the surface. â€¢ Fertilize your plant every two weeks after the blooming season with a balanced, all-purpose fertilizer. Continue through August. â€¢ By March or early April, when the colored bracts begin to turn or fall, cut the plant back leaving 4 to 6 buds. Re-pot into a slightly larger container (2-3 inches in diameter). â€¢ Keep the plant indoors near (not directly) a sunny window or in a morning sun-afternoon shade location. â€¢ Water and fertilize regularly, and by the end of May you should see vigorous new growth. Make sure to turn plants so that the new growth grows evenly on all sides. â€¢ If growing outdoors, bring your poinsettias indoors to a sunny location before night temperatures fall below 55-60Â°F at night. After checking for pests and diseases, place poinsettia in a south window. â€¢ Poinsettias begin to set buds and produce flowers as the nights become longer. Beginning October 1, keep your plants in complete darkness for 14 continuous hours each night by moving it into a dark room or placing a large box over it. During the day, allow 6-8 hours of bright sunlight. â€¢ Flowers should mature in 60-85 days. Continue this for 8-10 weeks, and your poinsettias should develop a colorful display of holiday blooms!